Place and “vernacular” in the garden are touchy subjects. I’m probably the last person in the world to talk about rules or norms respecting this because I’m sure I violate this sort of thing all the time. However, if we don’t think about having a sense of “local” place in the garden, all of our gardens will begin to look the same and pretty soon gardens from Maine to South Carolina and Northern California to Texas, North Dakota Georgia and everywhere in between will begin to resemble each other, plant wise and garden ornament wise. For example, where was the above photo taken? Any ideas? I thought not. It could be anywhere with the possible exception of Florida or Hawaii. What am I talking about? Well, it’s been happening for years. People move from one place to another and quite naturally want to grow their favorite plants in their new location. The unfortunate thing is that a good portion of “their favorite plants” include lawn. This is how Phoenix and the California desert became so water thirsty and Arizona can now no longer be recommended for allergy sufferers–the allergy sufferers who moved there planted the plants they loved from back home and now there is no respite. But aside from that, think about air travel for a moment. I’ve always found it amazing to get in a plane, go up and come down and when I get out, in the airport and to a certain extent even outside the airport, depending on where I’ve traveled, the stores are exactly the same as where I’ve come from. Nothing is new anymore. It’s all the same chains. There’s no escaping the same coffee houses, sandwich shops, burger places–you get the idea. Occasionally you’ll see something local, if you’re lucky. But if you go back to the same place year after year, you’ll probably find the local place is gone in a few years, sadly. Do we want our gardens to come to that? Do we all want to be growing the same lawns, trees, trendy shrubs, hydrangeas and roses? 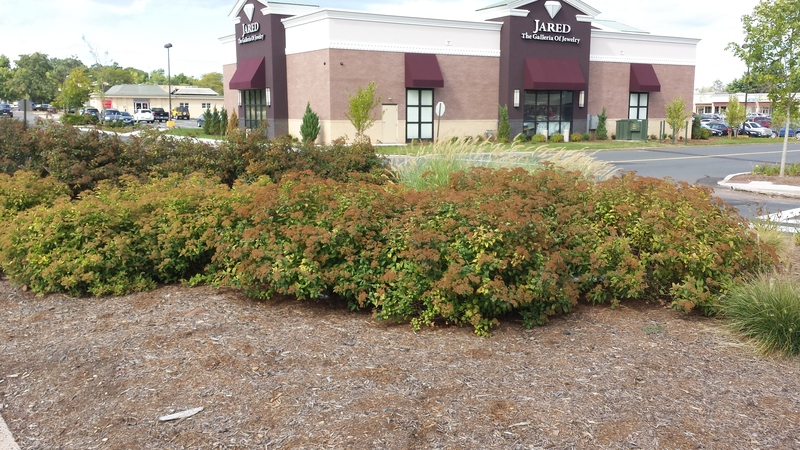 As it is, you can’t pass a strip mall without seeing Knockout roses, at least where I come from. Sure they’re great, but goodness! And it’s the same for the same daylilies, a limited number of grasses, and perish the thought, those Bradford/Callery pear trees! No imagination whatsoever! 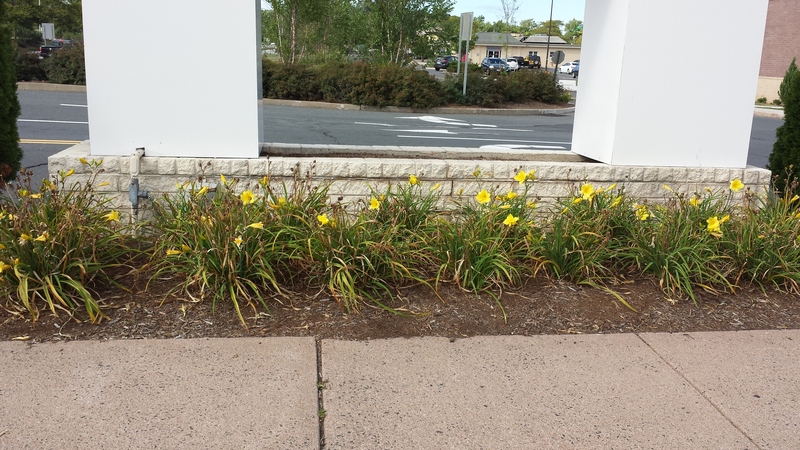 And look at these daylilies. They’ve seen better days, that’s for sure! 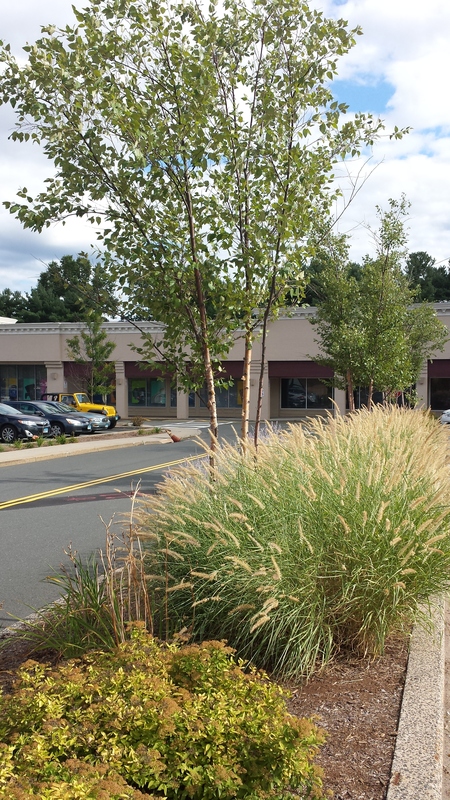 This is a strip mall in West Hartford. It’s been a bit notorious this week because a dead body was found there. It may have been the body of a man that was missing from his job at the mall across the street and it may have been there for as many as 2 1/2 weeks before it was found. Very sad! But the go back to the plantings, they’re used because, with the exception of the trees, they work. But nothing is native to our region, nothing is “special” and nothing shows any imagination. And don’t even get me started on ornaments in the garden! You make such excellent observations and I agree with you wholeheartedly. I wish it was part of our culture to appreciate native plants, but sadly it just isn’t. I’m not sure how this can be changed. Your mall looks exactly like the mall I drove past here in MA yesterday, except mine had the “pesticide use” flags everywhere. Really? Do we need to use pesticide to this extent in and around malls? It’s so horrific and depressing, too. Thank you –sadly I wish this weren’t true. And you are so right. What on earth are they treating for in these “landscapes? ” Perhaps if there were more native plants –& fewer monocultures–there would be no need for pesticides. I guess we can dream, can’t we? I agree! And it’s not limited to just public places either…. entire suburban neighborhoods often look like 90% of the “yards” have been done by the same landscaping company, complete with seemingly-obligatory weeping blue conifer. Ah, good point! You’ll see on Monday that some of my neighborhoods really know how to get creative–but you’re absolutely right. When I walk my dog, I often wonder who originally landscaped my neighborhood. While the homes are all different, the shrubs are almost all the same. It’s kind of funny–or maybe not.